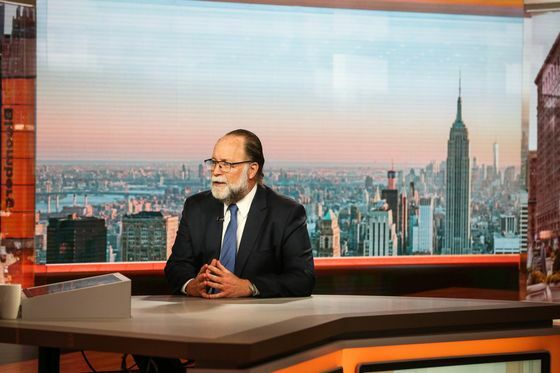 (Bloomberg) -- For years now, Ricardo Hausmann, the acclaimed Venezuelan economist who runs Harvard University’s Center for International Development, has been sketching out what he calls the morning-after plan. The morning after, that is, the socialist regime of Nicolas Maduro is ousted. That moment appears closer today than it has ever been, with much of the international community backing the young legislator Juan Guaido’s claim to the presidency. So Hausmann may soon find himself in a position to carry out -- or at least lobby for -- his vision for a recovery plan for the economically ravaged nation. He says he and Guaido have been talking regularly and that he’s serving as an informal adviser. For Hausmann, the key to any turnaround is a swift and massive injection of cash from the International Monetary Fund -- to the tune of $60 billion or more. The oil-rich country has been so mismanaged for so long that he says massive amounts of capital will be required to get the economy growing again by reopening factories, ramping up crude production and quashing hyperinflation. And in order to earmark as much money as possible to help everyday Venezuelans, he says, creditors need to brace for significant pain. That serves as something of a warning to traders who have been snapping up the defaulted bonds on the cheap -- some of them trade as low as 20 cents on the dollar -- on a bet that they’ll cash out at much higher prices in a restructuring. The nation’s benchmark bond due in 2027 tumbled by the most in four months Wednesday, losing 1.4 cents to trade at 31.6 cents on the dollar. His prescription for recovery involves more or less recreating a normal economy from the ashes of what’s left, bringing in raw materials and parts to reopen shuttered factories and creating a demand for workers. He likens the current situation to a taxi driver who has a car but no gasoline -- there are plenty of people who want to work, and a fair amount of infrastructure in place, but the economy needs an injection of fuel to get things humming. In this case, that fuel will come from the IMF rescue package, according to Hausmann. The influx of hard currency would go to investment in the all-important energy industry, fund imports and cover the government’s deficit, helping wean the country off the frenetic money-printing that has fueled inflation that’s counted in the hundreds of thousands. He doesn’t believe dollarization is the solution to the country’s inflation problem. “It makes it impossible for the government to balance its books,” he said. It’s far from certain, of course, that Guaido will be able to take over the country’s operations anytime soon. And even if he were to, it isn’t clear exactly how much influence Hausmann will have. Publicly, those close to Guaido haven’t recognized the relationship. Privately, they confide Hausmann and his team have played a role in shaping their policy views, but say they get advice from other economists as well. Hausmann’s been waiting for a chance to return to his homeland for years. The son of Holocaust victims who emigrated to Venezuela in the mid-20th century, he rose to prominence as a top economist in Caracas and went on to serve in the cabinet of the pro-market government that Maduro’s mentor, the late Hugo Chavez, sought to topple in a coup in the early 1990s. Hausmann left the country shortly thereafter, heading first to Washington, where he was chief economist for the Inter-American Development Bank, and then to Harvard. He’s publicly blasted the policy choices of the past two decades, earning the ire of Caracas in the process. In 2014, after one particularly caustic criticism of the regime’s blunders, Maduro decided he had enough. Calling Hausmann a “financial hitman” and “outlaw,” he effectively banned him from entering the country. The economist’s ties to Guaido stem from his relationship with Leopoldo Lopez, a Harvard alumnus and mentor to Guaido who is Venezuela’s most high-profile political prisoner. When Lopez was jailed by Maduro in 2014, Hausmann was influential in getting the university to throw its full weight behind him and honor Lopez as a distinguished graduate. The most urgent matter for Guaido and the countries recognizing him is to prevent Maduro from seizing its remaining foreign assets, Hausmann said. An initial attempt by the Maduro administration to pull $1.2 billion in gold from vaults at the Bank of England this month was stymied after top U.S. officials lobbied their U.K. counterparts. The U.S. has also certified that the National Assembly leader has control over key government bank accounts based in the U.S.
Hausmann’s past writings suggest he doesn’t have much sympathy for investors who purchased Venezuelan bonds in recent years as it became clearer that the nation’s debt load was unsustainable and it was prioritizing payments to creditors over importing food and medicine. In 2017, he lamented the so-called hunger bonds bought by Goldman Sachs Asset Management and called on JPMorgan Chase & Co. to remove Venezuela from its emerging-market bond indexes. He declined to estimate the recovery value on the country’s defaulted debt -- “the numbers are extremely fluid,” he said -- but estimates have gone as high as 80 percent, or double the historical average. 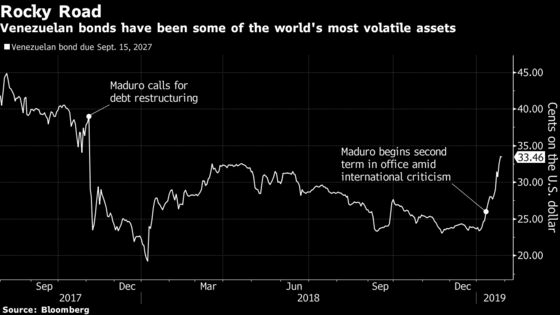 One possible way to allow Venezuela to quickly develop its economy while also allowing bondholders to benefit from the recovery would be to give them oil warrants that would pay out as the country begins to boost output, Hausmann said. The Harvard economist disdains the more than $50 billion in loans Venezuela took from Beijing over the past decade. He has said they were used for corrupt purposes that go undisclosed to the general public.